Join a Co-op and Bulk Up for Cheap! Grocery prices got you down? Organic foods seem out of your budget? Join a co-op and buy your natural foods in bulk. Order ahead and get what you’d need for a month. You’ll always have the staples at hand, and you’ll save some cash at the same time. Most whole foods are available by the bag or box, with 10, 25, and 50 pound sizes being the usual sizes. Rice, lentils, beans, oats, wheat, pasta, nuts and seeds are all available for much less than you’d pay for the fancy box with the cool colors, and you’ve contributed less waste to the landfill. Produce, grocery products, and personal care items are all great candidates for bulk purchases. Many co-ops will take special orders for bulk foods and other food items in quantity, usually for a discounted price. 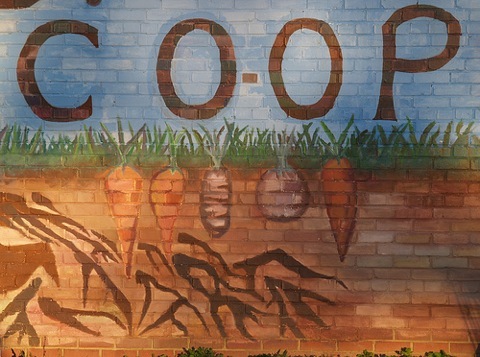 For a list of food co-ops across the US, see the Food Co-operative Directory at the Cooperative Grocer’s website. A cooperative is an autonomous association of persons united voluntarily to meet their common economic, social, and cultural needs and aspirations through a jointly-owned and democratically-controlled enterprise. Co-operatives are based on the values of self-help, self-responsibility, democracy, equality, equity and solidarity. In the tradition of their founders, co-operative members believe in the ethical values of honesty, openness, social responsibility and caring for others. Lower price per pound or package. Your pantry is stocked with the foods you always eat, making it less likely to eat junk food or eat out. Buying whole foods in bulk means fresher food. Ordering ahead helps in planning a food budget and sticking with it. We order fruit by the case, and rice, beans, sprouting seeds and herbs for tea in bulk. Our TP comes in a huge case, so we don’t ever run out. I like peanut butter, so I get that in a 15 lb tub, which lasts a long time. Many people that drink soy or rice milk order it by the case, and shampoo, soap, and cleaners are available as well. And if you eat only gluten-free foods, you can ensure your supply by buying in bulk, as well as avoiding any cross-contamination that may happen in a retail environment. Stock up and save at your local food co-op. I am working with a group to possibly start a co-op in our community. I am putting together a facebook page for it and wondered if I could use your image for now as the picture on the page?If not I understand, but it is a lovely shot. It’s not my image, but it has a Creative Commons license, so I don’t see why not.